Lets start with balance. This team has everything a team could dream of in their starting five; two bruisers, a facilitator, a playmaker, and an all around superstar. Roy Hibbert and David West make opposing players terrified to drive into the lane. George Hill has been great at the point, spreading the ball and averaging a healthy 13 points a game. Lance Stephenson has been a borderline All-Star this year. The 4th year player out of Cincinnati is averaging 14 points, 7 rebounds, and 5 assists a night. Night in and night out, Stephenson delivers consistent and strong play on both ends of the floor. Then there’s Paul George. After last years coming out party in the playoffs, the 6’9 Small Forward hasn’t taken his foot off the pedal. So far this season, George is averaging 23 points, 6 rebounds, and 4 assists, a game. He does all of this with a mere 2.5 turnovers a game. On the defensive end, the former Fresno State Bulldog has been unreal. On ball, George is averaging 2 steals a game. However, off the ball is where he really shines. George will allow shooters to have a little room, and then uses his wingspan to force the shooter into an uncomfortable shot. It is no wonder why shooters are only shooting 30% against him from the field. As good as the starting five has been, the team wouldn’t be nearly as good without its bench. Luckily, Indiana has the deepest bench in the league. Danny Granger, Luis Scola, C.J. Watson, and Ian Mahimini all know their role and play them to perfection. Special credit is due to Granger. As the former face of the franchise, Granger has accepted his off the bench role as is making the most of it. Coming off knee surgery, Granger is averaging 10 points and 4 rebounds in 23 minutes a night. All of these pieces accumulate into a comprehensive unit on the court and in the locker room. Notably, Indiana has been incredibly effective at moving the ball. All five position players seamlessly move the ball in an attempt to create the best shot opportunity. It is truly a joy to watch teams with such selflessness. The final step in the Hall of Famers creation was bringing in a disciplinarian on the court. It is one thing to have a respectable coach (if that’s not the case you have bigger problems), but to have a respected player, who controls the locker room, is priceless. Of all that mentoring, the biggest beneficiary of West’s help has been Center Roy Hibbert. Before West joined the team, the 7’2 Georgetown product was averaging a mere 10 points and 5 rebounds a game. He had been struggling on defense and had just been highly inconsistent overall. Since 2010, Hibbert has averaged 13 points, 9 rebounds, and over 2 blocks per game. With West keeping players like Hibbert and Lance Stephenson focused, the sky is the limit. When you look at what Larry Bird has done, it is truly an incredible feat. This year will mark the 10-year anniversary of the Malice at the Palace. Going from clowns like Ron Artest and Stephen Jackson, to consummate professionals like Paul George and David West is no easy task. 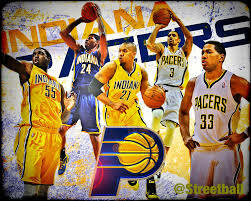 While the idea of a super teams like the Miami Heat have a shelf life, the Indiana Pacers will be around for a long time. Is the Stadium Series really necessary?